The Prior Scientific Lumen 200S is a powerful, cost effective alternative to standard 100 Watt mercury and halogen lamp houses. With a minimum exposure time of 30 milliseconds, the Lumen 200S is suitable for the most demanding imaging applications. A wide variety of control options are available for the Lumen 200S including RS232, USB, TTL and via the ProScan III shutter port. Designed to mount remotely via a two or three meter liquid light guide the Lumen 200S eliminates heat transfer to the microscope, minimizing thermal drift and aiding image stability in long term experiments. 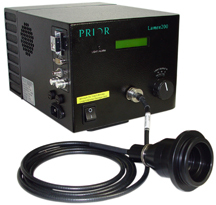 Lumen 220S models offers extended transmission in UV and IR compared to the standard Lumen 200S model.